If you have relevant tech, please express interest by January 18th, with invited final responses due by February 15, 2018. Final selection will be announced in March 2018. Selected performers will be funded at $50,000 for an initial first cut prototype. Some will be selected for a second funded validation prototype (at $100,000) over a total period of 18 months. The goal at the end of the second round is to have commercially-relevant capabilities that are also ready as a minimum viable product for initial field testing with responders. Will the Smart Cities Actuator Make Me a Gazillionaire? As they like to say in The Hunger Games, “may the odds be ever in your favor.” Meaning, that even though many people die along the way, and that your odds of hitting it big are likely smaller than you think, you never know, it’s the most exciting game in town, and what else were you planning to do with the next few years of your life anyway? Starting and running a business is sort of like that. What the actuator can do is substantially improve your odds of getting to a decent exit. Here’s how it works. Firs t, the failure rate for new businesses is very high. Per the attached chart, almost 78% of all startups fail within the first 5 years…only 22% survive. The comparable number for accelerator graduates is that, after 5 years, 33% are still in business, an increased survival rate of 50% compared to the population of all new businesses. Accelerator graduates also do m uch better at fund raising. There are about 800 accelerator graduates on average per year nationally, out of a total of nearly 600,000 new businesses created per year, or roughly 1/10th of 1% of all new businesses. Yet according to Pitchbook, this small population of companies accounted for almost 33% of the Series A capital raises in 2015. As part of my research into accelerator models I created a reference model, based on industry averages for funding at various stages of maturity, along with the likelihood that a company will move from one stage to the next. For a new startup company entering a typical accelerator program (and receiving an average $100K investment to start), about 2/3 of those companies will go on to receive Angel round funding on the order of $250K. Half of those will raise a seed round of $1M, and so forth down the fund-raising line. When you start stacking up those probabilities, here is what you get. For a single company coming out the end of the pipe with Series B funding, it takes three candidate companies who have raised a Series A round. Nine with a seed round, eighteen Angel round companies, and twenty-seven accelerator entrants needed to account for the successive attrition through the fund-raising rounds (very much in line with The Hunger Games odds, by the way!). Now some companies don’t go through this entire process, and many of the outcomes prior to a Series B can be very nice outcomes for the entrepreneurs. But, the reality is that accelerator graduates do MUCH better than non-accelerator startup companies in terms of both survival and fund-raising, and yet even with these advantages the numbers show only about 4% of these companies go all the way to complete a Series B funding round. One last consideration: the accelerator you’re in matters. Check out our next post for some more insight on metrics to help understand accelerator performance, and see the difference that a robust accelerator program can make. In a perfect world, the odds will be ever in your favor, and perhaps the coveted Initial Public Offering (IPO) will occur. Home free at last! Gazillionaire, here we come!! But, life is never quite that easy. Check out this great story from the L.A. Times for some additional insights into the tricky internal company business of going through an IPO. Next (Monday 3/13): How do we know the Actuator is Working? How Did the Smart City Actuator Originate? With any activity of the magnitude of our Smart City Actuator there are numerous threads that lead to it’s creation. This post covers three threads among many, from the CIT perspective: the motivation, the mission, and the experience base that makes it possible. The motivation is fairly simple. When I look out the window, the new Innovation Center Silver Line Metro station, two years in the making and now well along towards completion, connects via a new Innovation Avenue linking it to Rte 28 just north of Dulles Airport. It is not hard to imagine that buildings will soon replace the trees in the foreground as the property around the station is developed. The full Silver Line extension reaches well past the airport into Loudoun County, and last summer it became public that 22 City Link, the developer of the Gramercy District station in Ashburn was intent on building a smart city. So the tactical motivation was obvious: what a great target of opportunity to build an innovation district along this Dulles corridor and perhaps beyond, connecting with similar-minded initiatives along the Silver Line and more broadly in Virginia and elsewhere. The second thread is mission. As Virginia’s Accelerator, our CIT mission is to accelerate innovation commercialization and entrepreneurship across the Commonwealth. We do this through a number of programs, including grants (CRCF), direct investment (GAP), business accelerators (MACH37 and EMERGE), support to communities implementing new capabilities (Broadband) and others. Part of this effort involves looking forward to rapidly evolving technologies and how they will manifest in the market, and clearly the set of technologies around Internet of Things, autonomous everything, data analytics, and smart cities more broadly are an area of exceedingly rapid growth. Combined with the development happening literally on our doorstep, this was a no-brainer as a focus area that fits squarely in our mission sweet spot. There is another aspect of our CIT mission that is also critical to this focus area: our Statewide charter. As we look more broadly across Virginia communities, many of them are interested in adopting some aspect of this technology set. Many businesses already support specific products or niches within the broader space. Virginia Universities have world-class research under way in many of these areas. And State Agencies, such as VDOT in the transportation space, are working to understand and provide leadership in this new set of technologies that will certainly change the face of many Government functions and services. Two critical aspects for the success of a program like the Actuator are the depth of the mentoring community, and the opportunities to scale initial prototypes to a larger number of market opportunities. Our Statewide charter means that we are already aggressively pursuing partnerships with communities, businesses, State and local Government entities, and Universities to help harness this enormous set of resources. Through these collaborations we can help ensure the success of the Actuator and provide economic development opportunities throughout the region. The third thread that led to the Smart City Works Actuator is the experience base we are fortunate to be working with to launch the Actuator. CIT of course brings ten years of direct investment and interaction with early stage companies through our various programs, along with direct accelerator experience via MACH37 and EMERGE; we know what it takes to build one, and how to make it succeed. It was obvious from the very first meeting that a partnership between CIT and Smart City Works would lead to something special, and the preliminary activities to bring it to reality have only reinforced that initial impression. What you see is only the beginning! Every now and again the stars seem to align in a way that dares you to ignore the possibilities. For the Smart City Works Actuator, the motivation, mission, experience base and timing have all aligned, and we are fortunate to be in a position to seize the opportunity. Next (Monday 3/6): What Are the Economics of an Actuator? In a previous post we announced the Smart City Works Actuator and described the types of technologies we will be evaluating. But, hang on a minute, what the heck is an actuator anyway? In the spirit of “practice what you preach”, one of the things we teach innovators is how to describe their business in a 3 second sound bite (in case TV news ever asks…). So here is my sound bite for an actuator: it is a combination accelerator and incubator, with built-in path-to-market opportunities. 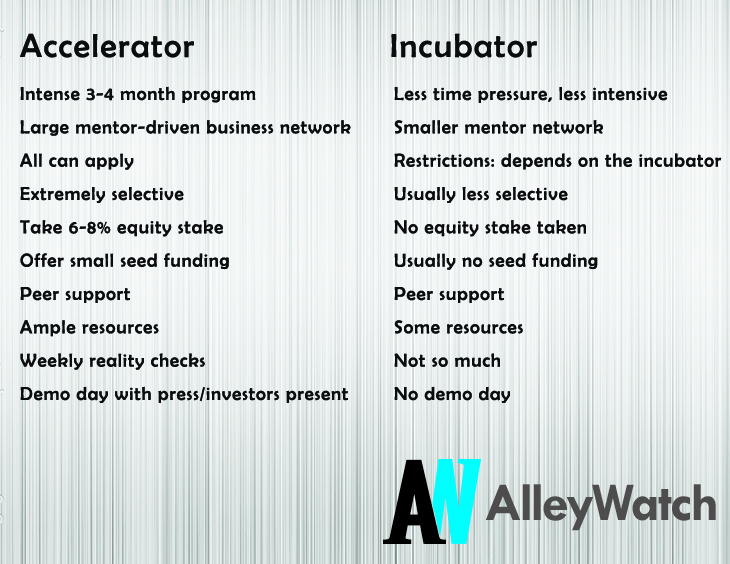 Well…ok…so what is an accelerator and an incubator, and how are they different? This chart from AlleyWatch provides a nice summary. Traditionally, accelerators are intensive training programs for newly formed or forming businesses, combined with some initial equity investment and extensive mentoring, and designed to position products in the market and secure early customers. Critically, the long-term success of an accelerator depends on the business success of the companies that participate. Traditional incubators tend to be more like co-working spaces where early-stage companies of varying maturities can conduct business and collaborate with peers. Generally the success of an incubator is less directly tied to the success of the companies located there, with the implications that there is typically no seed funding or equity stake for the incubator and less of a focus on a large mentor network. More recently, these “traditional” models are converging, with accelerators providing co-working types of spaces for their graduates, and incubators more actively mentoring and even investing in a few companies using the incubator spaces. Independent operations that may be focused on economic development or investment returns. As examples, Stanford and Carnegie-Mellon have well-known university-based entrepreneurship programs, as do many others. Stanford’s program is loosely associated with Y-Combinator, an independent accelerator operator focused on investment returns. TechStars is an independent accelerator operator with a large number of “franchisees” around the globe; roughly half of their business is from custom programs sponsored by specific corporate partners. In the Washington, D.C. area, AOL Fishbowl and others provide independently operated incubator space, and 1776 represents a network of such spaces. In this categorization, CIT is an independent accelerator operator (MACH37 and EMERGE) with an economic development mission. So, back to Actuator. The Smart City Works Actuator is a combination accelerator and incubator. That is, we expect to work with both newly forming businesses and somewhat more mature early stage companies. In our other accelerator operations, CIT has found that even the more mature of these companies can usually gain significant value from the intensive training opportunities and strong mentor network associated with accelerators in the AlleyWatch figure, while startup companies that graduate from the accelerator program continue to need the extended time frames and community support more typical of incubators. The Actuator is designed to provide both. There are also differences in the funding models indicated in the AlleyWatch figure; those will be the topic of a later post in this series. The remaining portion of the Actuator sound bite is “built-in paths to market.” One of the reasons that Corporate engagements via accelerators or incubators have become popular is the implicit path-to-market that a Corporate sponsorship implies. Corporations typically engage because they have difficulty innovating on their own, and are looking for additional products or capabilities to fill out their product lines. And in the end, many successful entrepreneurial companies are in fact acquired by Corporations; it is tempting therefore to focus primarily on this strategic path-to-market and ignore others. But this path is not without issues of its own, and many other paths to market exist as entrepreneurial companies enter their rapid growth phase. The accelerator approach of seeking external funding to fuel growth is of course an option. In addition to these however a core component of our Actuator is engagement with a range of testbed, pilot, and early deployment opportunities. We are putting in place a set of working agreements with Virginia Universities, State Agencies, localities around the Commonwealth and private organizations such as the Gramercy District, all leading towards direct opportunities for our Actuator cohort ventures to show their capabilities functioning in the real world. The tagline we use for this type of emergent ecosystem is Capital, Curriculum, Community. But if someone asks you what an Actuator is, just tell them: its a combination accelerator and incubator with built-in path to market opportunities. Next (Thursday 3/2): How did the Smart City Actuator Originate?